I thought this meant he understood the application and use of a Loaded Labor Rate which if you multiply the labor hrs for a particular task by the Loaded Labor Rate you then have a line item number for that tasks labor cost that contains your company’s Overhead & Net Profit. But this article and/or the methodology it is describing is all over the map and I find many things in it I really disagree with. With the big bugaboo, I have being the display of (big huge whopping figures for) Overhead & Profit information at the end of the Estimate which is a practice I think our industry really really has to abandon. Every remodeling sales presentation is a tug of war. The homeowners are pulling for a price breakdown, partly because they’re wary of being overcharged, but also because they need to make informed decisions about tradeoffs that affect their budget. The remodeler is pulling in the other direction and wants to reveal only the total cost of the job, partly because it’s easier, but also to avoid questions about markup and profit. They don’t really have an estimating system setup that allows them to provide a worthwhile breakdown for the client. As for contractors doing this to avoid talking about Markup & Profit that might be half true in that most contractors I talk to when it comes to explaining Markup & Profit and how they compute it or apply it are logical thinking disasters and don’t necessarily understand it that well themselves. The fact that we even think we have to display our Overhead & Profit to our clients is an unfortunate and even tragic leftover artifact from the 1980s where in the days before Excel was so ubiquitous a contractor would purchase an Estimate Worksheet and then list labor and material and subcontractor costs for a project and then there at the bottom of the sheet there would be a field for entering a percentage to multiply the Direct Job Cost total by to come up with an appropriate amount to add to that total to cover OH &P.
I think this display of OH &P is a real bad amateurish practice we need to end. There is not another industry I can think of where the standard pricing practice for projects involves breaking out a company’s Overhead and Profit on the job. If this was a good useful practice I think other industries would have picked up on it and started using it too. In my businesses, we will give breakdowns of costs to our prospective clients but we never breakout our Overhead and Profit and display it as these big huge hunks of cash we’ve added to our Project Costs. We’ve always done as William Asdal recommends in his excellent book Defensive Estimating: Protecting Your Profit….we “Use Retail Pricing at Every Line“. Breaking out overhead & profit doesn’t help clients make the decisions they need to make in planning their projects. It only confuses and obfuscates the issues. When you go into an Apple store you don’t get a breakdown of the materials, labor, overhead and profit that Apple calculates into the price of their products. You look at the machine and decide one way or another whether that 21.5-inch iMac with Retina 4K display is worth $1299. When I look to outfit a vehicle with storage boxes and a lumber rack I don’t get a quote that details the provider’s Costs for those items plus a breakout of what they are charging me for their Overhead and Profit. They give me Retail Pricing at Every Line for the features I want so I can make an easy decision about what my final truck outfitting project will cost. But the dynamics of this timeless struggle are changing, thanks to the leverage homeowners have gained from online research. The information they gather strengthens their resolve to demand more detail and openness—more transparency—around project costs. Some remodelers have adapted by taking a less adversarial approach, as we explored in our October 2017 feature on the subject, but most continue to resist. Re: “But the dynamics of this timeless struggle are changing, thanks to the leverage homeowners have gained from online research” on that point I absolutely agree. Commonly seen Across The Board Markup aka Volume-Based Markups place ridiculously high markups on materials so that when they see you have specified you’re installing a “68 in. x 80 in. Craftsman Bungalow 6 Lite Right-Hand Inswing Wheat Stained Wood Prehung Front Door with 14 in. Sidelites” and you are charging them $4,759.50 they want to know why when they see that Home Depot sells that same door for just $2,850.00. This whole Idea of “transparency” really began back in 1993 when John Case an editor at Inc. Magazine used the term in collection of articles describing the management model that Jack Stack used with notable success with his employee-owned company Springfield ReManufacturing (chronicled in The Great Game of Business 1992-2013 and A Stake in the Outcome 2002). Case then published Open-Book Management: The Coming Business Revolution in 1995. The basis of open-book management is that the information received by employees should not only help them do their jobs effectively but help them understand how the company is doing as a whole. Transparency, as is being talked about here, is that same open-book management idea applied to the business to consumer interactions. In a transparent communication or transaction, the consumer should have all the information they need to help them make effective and productive decisions in regard to their project. In fact, judging from the reader response, one example in that article seemed to embody remodelers’ worst fears: It gives homeowners a detailed price breakdown, including bare subcontractor bids and undisguised overhead and profit figures. In this article, we follow up with examples from Michael Anschel of Otogawa-Anschel Design+Build in Minneapolis who developed the system in response to the changing buying behavior of his customers and uses it every day. Anschel’s job proposals include three types of line items that most other companies avoid like the plague: bare trade contractor bids, supervisory time, and overhead and profit. Let’s look at how and why each one works. And this is where I really stray from the idea of displaying and sharing Overhead and Profit as line items in the client’s view of the project estimate. It’s not really actionable information. I also strongly disagree that “companies avoid like the plague [displaying]: bare trade contractor bids, supervisory time, and overhead and profit.“. Yes, I agree that the SWAG type contactors are hiding those figures but contractors who actually get into detailed cost estimating such as Unit Cost Estimating or even Systems or Parametric type estimates aren’t hiding Trade Contractor Bids. There are some contractors I know who don’t estimate project management on a line item level and try to make it a cost that is picked up by their markup I think that is a potential mistake. There specialty trade contractors who let’s say only perform one type of task day in and day out where yes that can be an effective strategy for any contractor who sees any kind of variation in the kind of work they do that can lead to inaccurate estimates. Meanwhile on that same project supervision component to a complicated bathroom remodel in the main house was about 1 hour of supervision time to two or three labor hours of trade work performed in that space. As for “Anschel’s job proposals include three types of line items that most other companies avoid like the plague: bare trade contractor bids, supervisory time, and overhead and profit.” I am not so sure that’s true at all. A couple of years back (October 2005) in an online forum I asked the question “Do you think Job Supervision be figured for and calculated as part of your Fixed Overhead or figured for as a Direct Job Cost?” and the results I got said 65.91% of those responding said “Job Supervision is a Direct Job Cost”, 20.45% said “It depends” and only 13.64% said “Job Supervision is Overhead”. While 80% saying “Don’t Break It Out” is great that still means 1 out of 5 contractors is displaying what the total amounts they are charging for Overhead and Profit. What the heck for? It is NOT actionable information. If a potential client wants to save a few dollars they can ask their contractor to use 1/2″ drywall instead of 5/8″. That’s actionable information. If they want to move up from Economy Level Kitchen Cabinets to Premium Custom Cabinets that information is actionable. But our Overhead & Profit as lump sums are not actionable. What is a potential client to say: “I think you should make less Profit, that figure sounds high to me” or “I think you can do a better job running your business perhaps not spend so much on marketing and you can, therefore, reduce what you are charging me for Overhead”. Those categories aren’t actionable so why break them out and include them? 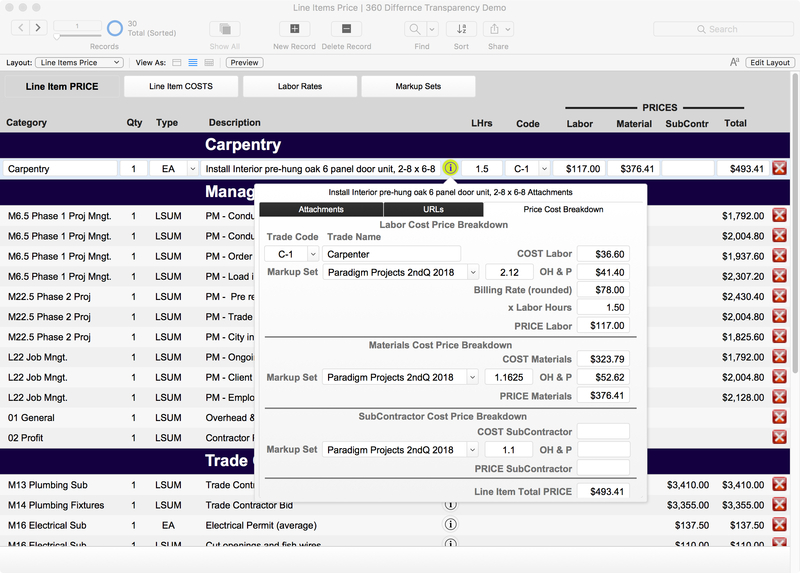 In addition to itemizing the invoice cost of materials and labor, Anschel also includes subcontractor bids as bare costs without an applied markup. Why? Because it simplifies the conversation. 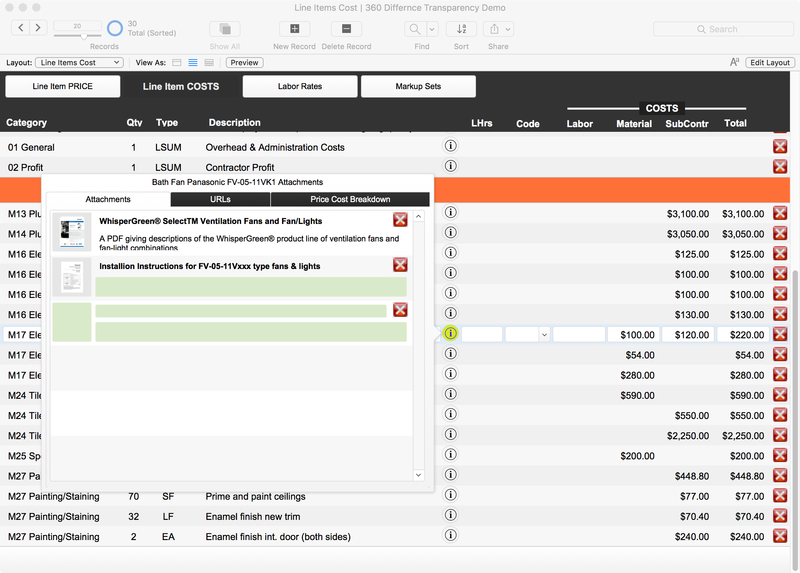 With itemized pricing, subcontractor quotes (for plumbing, in this example) or unit prices for subcontracted work (electrical, tile, and painting, in this example), are listed at cost, which makes them easy to discuss and alter without having to adjust for a baked-in markup. These bare costs also tend to compare more favorably with numbers clients may have obtained online or from friends and relatives. I don’t get the logic and thinkingthat listing Trade Contractor Bids at cost “makes them easy to discuss and alter without having to adjust for a baked-in markup.” What the heck? Discussing a line item at COST is discussing the line item at the contractors COST not the PRICE that the client ends up paying. At the very least even if a contractors decides not to markup a Trade Contractors Bid for Overhead there is the markup for Profit that applies to that line item. As for “…If a client does decide to check up on a trade contractor’s price, the number they get will be closer to a bare bid than a number that includes markup. “And that builds confidence.”” I think what Anschel is talking about here is an objection to the huge ridiculous markups contractors using a “traditional” Volume Based Markup have to apply to SubContract prices to recover their Overhead Costs i.e. 1.5 to achieve a 33% Gross Margin, 1.54 to achieve a 35% Gross Margin, 1.67 for a 40% Gross Margin etc. A contractor using a Capacity Based Markup method with a Loaded Labor Rate doesn’t have to do that. Their Fixed Overhead Costs were recovered as a function of their company’s billable labor on the project. So instead you see a markup of anything from 0% to 18% which is much more palatable and acceptable to the potential client. What if the clients take something out of the scope or add to it? That still involves some recalculation, but the adjustments are simpler to make than they are when markup is built-in to every line item. I really don’t see how the recalculation of OH & P in Anschel method is any easier than any system where the “markup is built-in to every line item.“. I can’t think of a professionally designed or executed remodeling estimating tool (Excel-based or database solutions) where that’s a problem. Yeah, there are some contractors who have cobbled together some homegrown Excel-based solution where the computations are a mess but that is what those of us in the computer programming trade call a PEBKAC Error. Problem Exists Between Keyboard And Chair. If a contractor is just copying and pasting the Price information straight out of a data book into their spreadsheet then that can be a problem when you’re making changes and adjustments but that is again just “bad practice”. A portion of labor cost on any remodeling job is time spent coordinating with and supervising other people. Most companies treat these tasks as indirect costs that fall “below the line,” and assume they’re covered by their markup. But Anschel disagrees. Again as I commented on above most companies do NOT treat Project or Job Supervision as something that should be covered by Overhead although I DO THINK that contractor’s spend enough time looking at the time involved with Supervision and then to rely on just figuring Supervision as a percentage of either the time (better) or total cost of a group of tasks (not so good). Certainly to his credit I really like the way I see Anschel estimating his Project Supervision on a more granular basis than most contractors. can’t tell you how few contractors I see that actually figure out Procurement Costs (i.e. Anschel’s “PM – Order Materials / schedule delivery & inspections” etc.) which is often a huge profit drain. Certainly, most construction estimating databooks don’t really address those types of costs at all. Project management (PM) tasks are listed as direct costs rather than as overhead that is covered by mark-up. This makes for a more accurate estimate, and gives clients a clearer picture of how their budget will be spent. As with subcontractor bids, these numbers can easily be adjusted up or down if the scope of work changes. Overhead and profit are also listed separately and are unaffected by minor changes in other line items. For large up or down adjustments to the scope of work, rather than having to recalculate all line items because they contain a built-in markup, overhead and profit can easily be recalculated in the presence of the client. In his system he spells out these tasks in a dozen or so line items that fall “above the line,” where they give him a much more accurate idea of the true costs of the project. For example, most estimators include fees for zoning and permit applications, but time spent to administrate those activities is considered part of overhead. Not so with Anschel’s system, which lists a dollar figure for the time required to prepare and follow up. The same is true for ordering materials, scheduling deliveries, and waiting for inspections, as well as client meetings, job documentation, and trade contractor supervision. The idea is to account for all costs that are specifically related to a particular job. Rather than leave those costs to chance (or harbor an unrealistic hope that the crew will avoid them), Anchel lists them directly. It also serves as reminder to the estimator to consider any special circumstances that a given job may require, and, Anschel says, it helps clients understand where some of the total project cost comes from. “Yes, absolutely estimate Project management tasks as Direct Job Costs. While it’s possible that there are some specialty trade contractors whose crews only perform one type of task where figuring you Job Supervision as part of your Overhead those cases are incredibly rare and as Sal Alfano writes: it “gives clients a clearer picture of how their budget will be spent.” and demonstrates your attention to details and puts “trust dollars” in your authority and expertise bank. As for: “…Overhead and profit are also listed separately and are unaffected by minor changes in other line items. For large up or down adjustments to the scope of work, rather than having to recalculate all line items because they contain a built-in markup, overhead and profit can easily be recalculated in the presence of the client.” I strongly disagree. Again as I alluded to above if you have a professionally executed estimating system the recalculation of items that have been marked up are done automatically and seamlessly. If you have to adjust and make those changes individually line by line there is really something wrong with your system. I have an estimating system where I am actually able to see how much I am recovering for Overhead & Profit on a line by line basis and to say “minor changes” in project scope is a mistake. I can see how those minor changes of $8.35, $15.65, $65.80, $38.40 can add up quicker than you think or are ever aware of (that’s $150.00 right there). To say that “Overhead and profit are …are unaffected by minor changes in other line items” is a mistake. And when I read: “For large up or down adjustments to the scope of work, rather than having to recalculate all line items because they contain a built-in markup, overhead and profit can easily be recalculated in the presence of the client.” I WANT TO KNOW HOW? There are only two ways to recover for Overhead (and Profit) that I know of. In one of those methods, the driver is the monetary TOTAL OF THE PROJECT’S DIRECT JOB COSTS. This is the “traditional” Volume Based Markup I often rail against. The other method is where the driver is how much of your company’s CAPACITY (available billable hours) is consumed by the project. The Capacity Based Markup method I write about and advocate. I can’t figure out what the driver in Anschel computations is. Is it the dollar volume of the whole project or how my company capacity it ties up and consumes? Or is the Overhead & Profit figure (God Forbid!) a subjective decision? If the Overhead & Profit are not programmatically tied to either the Direct Job Total (the Volume Based Method or the Billable Labor Hours the project generates (the Capacity Method) in the software then how are they computed and figured out? For a lot of remodelers, however, the elephant is still in the room. While Anschel’s transparent system may provide a more accurate estimate, overhead and profit, the last two line items on the estimate, are out there in plain sight and have to be acknowledged—and possibly explained and justified. For Anschel, the positives of this situation far outweigh any negatives. As we have seen, with no hidden markup to manipulate, adjusting allowances and trade contractor prices is simpler. But the same is true of other changes. This is a Pandora’s Box that never had to be opened. This is a legacy artifact leftover from the 1980s where in the days before Excel was so ubiquitous a contractor would purchase an Estimate Worksheet and then list labor and material and subcontractor costs for a project and then there at the bottom of the sheet there would be a field for entering a percentage to multiply the Direct Job Cost total by to come up with an appropriate amount to add to that total to cover OH &P.
There are no other industries I can think of where this is in anyway a common practice. I can think of several things that can happen when you breakout and display Overhead & Profit and none of those things are good. It’s entirely conceivable that a potential client could look at your project estimate and say to themselves “This guy is charging us more for his Profit than we are going to pay for our Kitchen Cabinets.” or “Can you believe this joker is charging us xxxx dollars to cover the operating expenses of his company“. Rather than giving them such huge chunks of dollars to swallow all at once, I think it is far better to give it to them in smaller easily assimilated bite-sized chunks. Figure your overhead and Profit on a line item basis and if you feel you really have to show it to them show it to them on a line by line basis. Really if they are bothered by your company generating Overhead &Profit and want to reduce their overall project costs you will have to value engineer their project on a line by line basis. As for Anschel’s “Let’s say the client wants his uncle to build and install the cabinets,” example I am lost to figure out what he is talking about. If my company was to face that we would lose not only the Labor Hours for installing the cabinets but also the Labor Hours for the Planning and Supervision too and in fact we would increase the amount of Supervision for that phase of the project because “wants his uncle to build and install the cabinets,” sounds like we’re getting a hobbyist woodworker to work with. But the changes to our Overhead Recovery and Profit would be significant and as for doing the math “in front of the client” why would you have to do the math if Overhead and Profit recovery are computed programmatically by your estimating software? We would delete (or turn off) the Cabinet Installation Line Items and add a few Supervision hours to the supervision line item to watch that uncle and all the required math is done in the backgroud by our software in real time as we make those changes. For Anschel, transparency is one hallmark of the digital age, and he’s certain that homeowners are going to be exposed to it somehow. “If contractors don’t do this,” he says, “somebody else in their market will.” For him the risk of doing things the way we’ve always done them is greater than the risk of doing things differently and potentially losing a job because he showed his true costs. …and then they just pick a markup based on something they read or heard somewhere and then “make it work” rather than crunching the numbers to find out what their number or numbers should be. They then raise their markup number when they find themselves missing or overlooking things in their estimate to cover for that. Then there is this other group of contractors that work to indentify all those tasks that surround the 90 minutes that it takes a carpenter to install a door and jamb that take up time and money like ordering the door, shipping & delivering the door, distributing the door on the jobsite, etc etc. Consider not only the cubic foot, cubic yard, lineal foot, square foot, pound or ton but all of the complicating conditions encountered in putting the materials in place. That’s The Golden Rule of Construction Cost Estimating, as quoted from Richardson Engineering Services General Construction Estimating Standards. Michael Anschel is entirely correct in moving any management tasks he can out of a catch-all Overhead category and into the more precise and accurately defined Direct Job Costs. That’s a best practice. But then again Don’t Display Overhead & Profit Figures In Their Own Separate Categories especially if they appear at the end of your estimate where you are displaying the Total Project Price. That is the first place your clients will look at when reviewing your estimate and human cognitive biases being what they are when the potential client sees those big numbers for Overhead & Profit they will be subject to the “Anchoring Effect” (a bias that causes people to focus on the first available piece of information, the “anchor” given to them when making decisions). Their focus should be on the actionable elements of their estimate. Another cognitive bias those numbers will be subject too is Loss Aversion Bias. The Loss Aversion Bias is people have a tendency to prefer avoiding losses than to making equivalent gains: it is better to not lose $100 than to find $100. If they look at the big lump sum numbers for Overhead & Profit and in any way feel they might be too large or inflated that will consciously or even sub-consciously influence their decision making and they will weight the loss of the money they are paying you for Overhead & Profit over the cost of those incredibly beautiful cabinets they always wanted. There are other cognitive bias we need to learn about and understand better that maybe I write about in a future blog post but those two are a good start and you can learn a lot about them by just Googling “cognitive bias” or someone like Daniel Kahneman a Nobel Prize-winning psychologist who is noted for his work on the psychology of judgment and decision-making. In Lean Thinking value is always defined by the Customer. At the end of the day, it doesn’t matter whether you came up with a great idea if the customer doesn’t see any value and he or she is not ready to pay for your great idea. I think your company’s overhead and profit are tough sells to the prospective client in terms of value to them. Overhead and Profit can probably “Necessary Waste” – they activities that our customers have no interest paying for, but they are required to maximize the value of the end product. No one wants to eat a whole bowl full of salt but a little bit of salt distributed sprinkled on all the different components can enhance the taste of those items. Displaying you Overhead and Profit in big bowls of their own at the end of an estimate (which as I just alluded to is really displaying them right at the top) isn’t as appetizing as it is spread around throughout the meal. Michael Anschel is something of a thought-provoking Renaissance Man polymath, you should follow him on Twitter and look for his speaking engagements on YouTube) and I think I recall in one of his speaking engagements he said something to the effect on not taking things on faith, avoid being dogmatic and if someone presents reasons why something your doing is not necessarily a good idea keep an open mind and listen so I hope he appreciates what I’m writing here. My Solution,… A Filemaker Pro App That Delivers “Transpancy” As Well As Other Helpful Data For The Clients Education And Decision Making Process. I guess it was sort of fortuitous that just the other day FileMaker Inc. which produces the database development platform I prefer to work with released a new version of eponymous product FileMaker Pro 17 and I decided in order to give it a fresh new run to familiarize myself with what was new I would develop a small little app to show how transparency can be better delivered on a line item basis and we can also use the same delivery method to deliver more information and data to our clients too to help them in their decision-making process, So after about an hour of work getting started on this in the afternoon I sat down to watch the Yankees beat the Astros 6-5 in 10 innings. So this little project took me about 5 hours to cobble together and while this is not as robust, polished, or finished as my 360 Difference System it does show how you can rapidly develop some pretty neat stuff using FileMaker Pro 17. 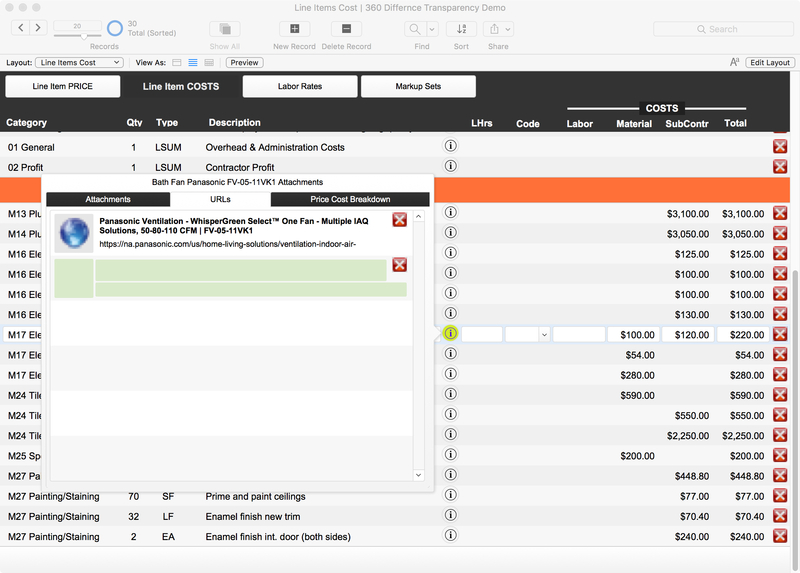 Below is the opening screen that shows the Estimate Line Items in a “Price” view meaning a Markup has been applied to the Labor Cost, the Material Cost, and the Subcontracting fields. While I built this demonstration using the field data from the article I added one line item of work being performed by a Carpenter to illustrate how the Labor and Material Pricing is broken down to transparently show how it was derived. That line item: “Install Interior pre-hung oak 6-panel door unit, 2-8 x 6-8” is the line you see on the top of the screenshot below and the yellow-green Infomation Icon Button has been clicked on to show how the Price for the Line Item was ultimately computed. To come up with the Price for “Installin an Interior pre-hung oak 6-panel door unit, 2-8 x 6-8” I first selected a Trade to perform the task and I selected the Trade Code C-1 which in turn plugged the Trade Name “Carpenter” into the form and plugged the Burdened Labor Cost for that Carpenter ($36.60) and the marked up and rounded off Billing Rate too ($78.00). Now I have clicked one of the buttons at the top of the screen and switched over to the Lien Item Cost View. It a different colored screen to help aid the user in knowing they’re on a different screen from the cost view since everything else on the page looks the same as the Price View only now were are looking at just the Line Item Costs. This time I’ve clicked on the yellow-green Information Icon for the installation of the “Bath Fan Panasonic FV-05-11VK1” which Michael Anschel has being installed by a SubContractor. The yellow-green color of the Icon Button is telling the User that there is some supplementary data or files attached to this particular Line Item. The Attachments Tab in the little Popover Window is showing us there are 2 PDF documents we can open and look at (or download and save) . One is about the WhisperGreen product line and the other is Installation Instructions. Clicking the URLs tab in the popover shows there are also some URLs we can click on the Web Globe Icon button to open a web pages with more information. 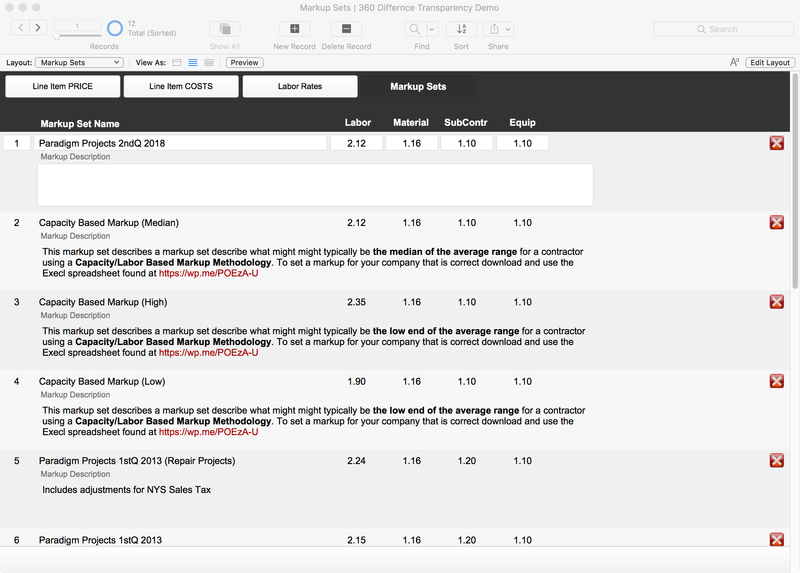 This next screenshot below shows the Labor Rates data table which takes a Base Trade Rate Wage and then applies a markup to cover for Labor Burden and then allows you to again add a markup to cover your Fixed Overhead Costs.I’ve just plugged in some values I seen before in my work but these are all number you can and should figure out specifically for your company. Shawn McCadden has a free Excel worksheet for figuring out Labor Burden you can ask him for on his website and I have an Excel Workbook that does the Burden Calculations and the Fixed Overhead computation for $30 you can purchase here: The Capacity Based Markup Worksheet and I have built this into my 360 Difference Systems software but the figure I have plugged in are “close enough” for the purpose of this demonstration. This next screenshot below shows a tool that appears in my 360 Difference Systems which is a table called Markup Sets. This table is where the markup that you want to apply to your costs for Overhead and Profit is created and then stored. Unlike some estimating programs the user has complete control over the calculation of markup and the way the spread is allocated individually towards labor, materials, and external (subcontracted costs). It also allows you to create and store additional Markup Sets so that if you happen to have a preferred long term client you wish to provide a discount for you can create a unique Markup Set for them in much the same way that you could also create a unique higher Markup for a, particularly difficult client. For example we had a luxury buider we did a lot of subcontracting of finish work for and depending upon the year he was responsible for anywhere from 10% to 60% of our total volume and his projects were a pleasure to work on so he hard a markup set that had lower markup figures since he brought us so much work. Meanwhile, we had another builder who was something of an inconvenient nightmare to work for and his markup rates were higher than our standard rate which we re-evaluated every quarter which is why you see a description that reads: “Paradigm Projects 2ndQ 2018”. This also allows you to experiment with bids produced a different Markup rates while still affording you the convenience of being able to “roll back” to your old markup structure if you need to. YES, a thousand time yes we should all work hard on better defining and estimating of project management and supervision tasks and treat them as Direct Job Costs and not try and cover them via our markups for overhead. As for displaying Overhead and Profit figures and line item costs… DON”T DO IT. It just distacts your clients from the items in thier estimate they really value and can act on and aid in their decision making process. I have no idea what the wholesale cost of kitchenware is and what kinds of markups retail stores apply to them so my figures are entirely made up guesswork but my point is how is seeing that kind of breakdown helpful to my decision-making process in regard to is that pan worth $39.99. What is better more useful information to me the consumer? The pan is still going to cost me $39.99 (plus tax) if I want it. As a consumer I have no idea what it takes to run a kitchenware retail store or how much they need to spend to keep the doors open so how would I know what an accurately and correctly justified price is? I can’t think of any other industry that Prices their consumer products breaking out the company’s Overhead & Profit and the only reason it is prevalinent in our industry is because it a legacy of a time where we would purchase an Estimate Worksheet and then list labor and material and subcontractor costs for a project and then there at the bottom of the sheet there would be a field for entering a percentage to multiply the Direct Job Cost total by to come up with an appropriate amount to add to that total to cover OH &P. And we would they mistakenly hand over the worksheet that was supposed to be for our internal use to our prospective clients. …And less of them that breakout our Overhead & Profit figures as standalone costs. We need to stop making unforced errors.